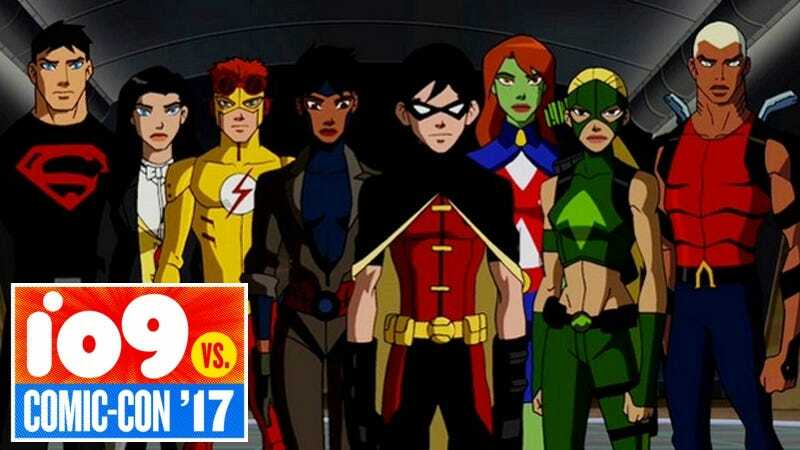 Very few things in the world excited us as much as the news that the cruelly truncated Young Justice would be returning for a third season in 2018 on a new DC streaming service. The announcement was light on details, but thanks to crowded early morning panel at San Diego Comic-Con we now know that the season will be 26 episodes long and three new members of the team. Image: DC. From left to right: Static, Kid Flash, Robin, Wonder Girl, Spoiler, Blue Beetle, Thirteen, Arrowette, Arsenal and Beast Boy. The third season, called Young Justice: Outsiders, will include Arrowette, Thirteen, and Spoiler. Thirteen looks like she could possibly be this show’s version Traci-13, a supernatural/magic-based hero who lived in Metropolis’ slums after her father forbid her from learning magic but learned it anyway. However, she was described to the audience as a flat-out new season three character—although that might just mean she is new to Young Justice instead. The other two, of course, were very briefly glimpsed in the previous seasons as characters whose lives were impacted by the characters we were following. Producer Greg Weisman explained Arrowette is “that little girl who watched Green Arrow and Artemis save her father’s life, [and] this is the natural evolution.” These new characters were inspired by the show’s heroes, the same way the original show’s heroes were inspired by their mentors. “That’s not to say we won’t tell stories with the characters from [earlier] seasons,” promised co-creator Brandon Vietti. Weisman added, “One of these characters came to us and said ‘I’m not done,’ and it became clear that this character was going to be a major lead in the series.” Go ahead and start wildly speculating now. Artemis, Nightwing, Aqualad, and Superboy, all in sneaky, stealth-oriented costumes. It seems like some of the most familiar members of the team might be off doing their own thing in Outsiders.